" We socialize the cause of the fire, how to handle the flames and where should residents contact the officer"
68 residents of RW 03, Kramat Urban Village, Senen, Central Jakarta get socialization and fire training today, Monday (8/27). 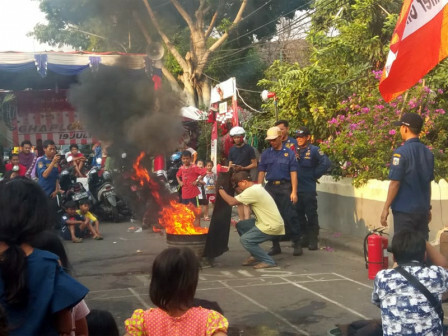 "We socialize the cause of the fire, how to handle the flames and where should residents contact the officer," expressed Achmad Syaiful Khafi, Sector Head of Senen Sub-district, Monday (8/27). They are taught how to put out by using wet sacks and portable fire extinguishers (APAR). "They looked enthusiastic when given material on how to handle gas tube hose leaks," he admitted. Cipay (20), one of residents admitted that he is happy to get new knowledge. "Thank to the firefighters, it's really very valuable, especially about the early handling of fires," he stated.